Whether you're new to sewing or are an experienced seamstress, free doll patterns can offer just the inspiration you need to create a personality-filled doll for that special child. Choose a design to fit your personal style and experience level, and you'll be sure to enjoy this fun project. 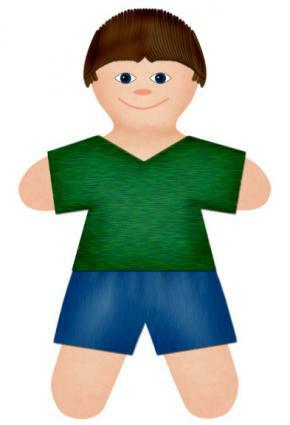 This adorable little boy doll is a great first project for a child. Adults can make things a little more challenging and detailed by embroidering on the face of the doll. Click to download this boy doll pattern. Print out the sewing pattern for the boy rag doll, and cut out the pattern pieces. 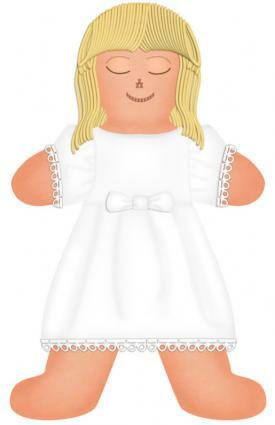 Choose one body piece to be the front of the doll, and embroider or paint a face on the head portion. Set this aside. Cut the yarn for the hair into pieces that are about six inches long. The number of pieces you'll need will depend on the thickness of the yarn and the desired look of the hair. Starting at the nape of the neck, machine or hand sew one row of yarn to the head part of the back body piece. Move up about an inch, and sew another row of yarn on. Continue until you've reached the top of the head. Be sure to leave a quarter inch of fabric all the way around for your seam. Stack both of the body pieces with the right sides together, making sure all the notches match up. Sew around the entire body, leaving only a small area open on the side for turning the doll. Turn the body right side out, and stuff to the desired firmness. Hand sew the side closed. Trim the doll's hair and style as desired. Set the doll aside. Cut out the t-shirt and shorts pieces from the colored fabric. For the t-shirt, place the right sides together and sew the shoulder seams first. Then hem the cuffs of the sleeves. Next, sew up the side seams and hem the bottom and the neckline. Put the shirt on the doll. For the shorts, place the right sides together and sew both side seams. Then hem both cuffs, and turn over the top waistband to create a casing for the elastic. Thread the elastic through the casing and adjust it to fit the doll. Then sew the inseam to finish the shorts. Put the shorts on the doll. Sew suspenders on the shorts for a fun retro look. Style his hair in a punk style. Choose a non-traditional hair color for something a bit unusual. Use an iron-on graphic to give his t-shirt an edge. If you're looking for a project to share with the special little girl in your life, this may be just what you need. You can work together to create this doll, which she'll treasure almost as much as the memories you make sewing it. Click to download this girl doll pattern. Print the free pattern for the girl doll and her clothes, and cut out the pattern pieces. Select one of the body pieces to be the doll's front. Use fabric paints and markers or embroidery floss to create her face. Set the doll front aside. Cut dozens of eight-inch-long yarn pieces to make the doll's hair. You'll be able to trim them later, so they don't have to be perfect. Begin sewing the yarn in rows onto the back part of the head. You can use the sewing machine or do this part by hand. Start at the nape of the doll's neck, and work your way up in rows about an inch apart, leave a quarter inch all the way around the outside of the head. Stop when you reach the top of the head. Place the body pieces together with the right sides inside. Make sure the body parts and notches match up. Start sewing at just under the arm, and continue all the way around. Leave a small opening to turn the doll right side out. Turn her right side out and stuff the doll to the desired firmness. Hand sew the opening closed using a slip stitch. Arrange the doll's hair so it falls evenly. You may need to hand sew a few additional pieces on to give her the look you want. Trim as desired and style with ribbons. Set the doll aside. To make her dress, cut the bodice and skirt pieces out of cotton calico and the apron out of white lawn. Hem the bottom of the skirt piece and trim with lace if desired. Gather the top of the skirt piece and set aside. Place the two apron pieces together, and sew all the way around the curved edge. Turn it right side out, and press with the iron. Then gather the top raw edge and set aside. For the doll bodice, stack two pieces with their right sides together. Sew the curved seams of the arm holes and the neck hole. Turn the bodice piece right side out and iron flat. Then repeat with the other bodice piece. This facing eliminates having to hem the curved edges of the dress. Place the two bodice pieces together, and sew both shoulder seams and one side seam. Adjust the gathers on the skirt piece so that it matches the width of the bodice piece, matching the open side of the bodice with the raw edge of the skirt. Pin together. Then insert the apron piece into the seam, so it will hang down in front. Sew the entire waist seam. Then sew up the side seam of the dress and put it on the doll. Add tiny buttons to the front of the dress. Attach ribbons for her apron strings. Use extra lace to trim the apron and the collar and arm holes of the dress. Add a pocket to the apron. Use antique or vintage fabric for the doll's dress. Print this snuggle doll pattern. This sweet snuggle doll makes a reassuring friend for a new baby and it's a perfect option if you're looking for a handmade baby shower gift. This easy pattern is ideal for the beginning seamstress, and it can be a great choice if you're crafting with kids as well. 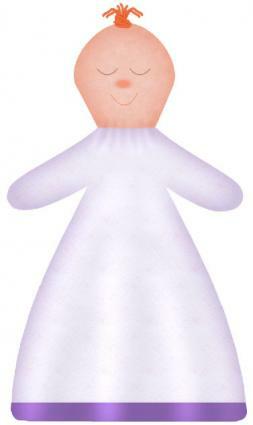 Print out the snuggle doll pattern and cut out the pattern pieces. Pin the pieces to the fabric and cut as directed. Set the head piece aside. Place the right sides of the body pieces together and pin. Sew all the way around the doll body, but leave the neck open. Turn the body right side out. Cut the blanket binding to fit the bottom of the doll body, and turn over the raw ends. Topstitch the blanket binding to the bottom of the doll. Lightly stuff the doll body. It should be very soft. Use a yarn needle threaded with yarn to make a top knot in the center of the doll head pattern piece. Next, use larger stitches to sew around the outside of the head piece, and gather the stitches by pulling on the loose thread. Don't pull the fabric all the way in yet. Stuff the head, giving it a much firmer texture than the body. Pull the fabric in the rest of the way, and hand sew through the gathered area to secure it. Turn over the raw edges of the body, and insert the head into the neck opening. Use pins to secure it. Hand sew the head in place until you're certain it is secure. Remember, babies can be rough on toys, and you don't want the child getting ahold of any small pieces. Finally, draw a sleeping face on the doll using the fabric markers. Print this free sleeping doll pattern. If you're looking for a doll pattern that's a little more challenging, the sleeping doll would be a great project to stretch your skills. This doll makes a nice gift for an older child. To get started, print out the pattern for the sleeping doll and nightgown. Cut out the pieces as directed. For each arm, place two of the arm pieces with the right sides together. Sew all the way around the arm and hand, leaving the end of the arm open. Turn the arm, and stuff to a medium firmness. Pin the shoulder to keep it closed. For each foot, place two foot pieces together and sew all the way around, leaving the ankle open. Stuff the foot to a medium firmness, and pin the ankle to keep it closed. For each leg, place the two leg pieces with their right sides together. Sew down each side, leaving the ends open. Turn the leg right side out, and turn over the raw edges on one end. Insert the foot into this opening and pin in place. Sew to secure the foot to the leg. Then stuff the leg to a medium firmness, pin the opening closed, and set aside. On one torso piece, make a French knot of flesh-colored embroidery floss for the belly button. Place the two torso pieces with their right sides together, and sew up each side from the underarm to the hip. Sew the small seams at the crotch and shoulders. Turn the torso right side out and turn over the raw edges at one shoulder opening. Insert the arm into the shoulder, and sew it in place. Repeat this process for the other arm and both legs. Stuff the torso. Hand sew stitches to separate the fingers on each hand. Set the body aside. Cut yarn to twice the desired length of the hair. You'll need several pieces, depending on the thickness of hair you have in mind. Carefully holding the hair in place, hand or machine sew the yarn across the head near the nape of the neck. Move up about half an inch, and sew another row of hair. Repeat until you've covered the entire back of the head. Be sure to leave a quarter of an inch at the end and beginning of each row. 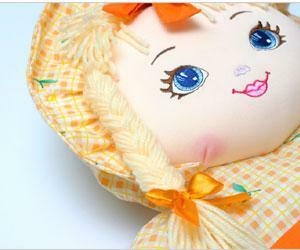 For the face of the doll, use your imagination to embroider on a nose, mouth, eyebrows, and sleeping eyes. Place the face and back of head together with the right sides inside. Sew all the way around the head, leaving the neck open enough for you to turn the head right side out. Turn the head and stuff it. Close up the opening as needed, and then insert the neck into the neck opening of the torso. Sew the head securely in place. Adjust the hair as you like. You may want to add some additional strands to provide bangs. Trim the hair, and tie in braids or ponytails if you like. Set the doll aside. To make the nightgown, place the bodice front piece and one of the bodice back pieces with the right sides together. Sew a seam at the shoulder. Repeat with the other bodice back piece. Set aside. Stack two sleeve pieces with their right sides together, and sew a seam along the top edge from shoulder to wrist. Gather the shoulder portion of the sleeve, and adjust the gathers so that the sleeve fits in the opening of the bodice armhole. Sew in place. Repeat with the other sleeve. When both sleeves are sewn on, sew another seam from the wrist, down the sleeve, under the arm, and down the side of the bodice. Repeat with the other side. Gather the top of the nightgown skirt as directed in the pattern. Adjust the gathers to fit the bottom of the bodice, and sew the skirt in place. Sew up the back of the nightgown until you reach the point where the bodice joins the skirt. Hem the bottom of the nightgown skirt piece, as well as both sleeve openings, the neck hole, and the rear opening of the nightgown. Trim the bottom of the skirt and the sleeves with lace. Hand sew tiny snaps onto the back of the nightgown to close it. Attach a small bow in the front center of the nightgown. Put the nightgown on the doll and enjoy! Crafts Beautiful - More experienced sewers can put their skills to work making the "Dolly Mixture" doll. Everything you need to know is included, such as the template, materials list, and detailed instructions. The Dolly Llama - This soft-sculpture doll pattern s a breeze for beginners to doll making. Instructions are accompanied by color photos that show what each segment should look like. HGTV - Doll makers with soft sculpture experience will fare well with this simple pattern which yields a pretty young girl with brown hair and big eyes. The quality of the instructions makes this a good option for beginners and intermediate doll makers who wish to practice their skills. 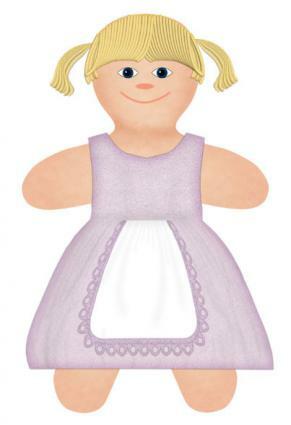 Cloth Doll Connection - You can find all kinds of cloth doll patterns suitable for a full range of sewing skill levels at this website. Nuno Doll - If you're looking for something a bit more complex, the patterns on this site will definitely inspire you. Most are not for the novice seamstress, but they are very impressive if you're looking for a challenge. Whether you choose a simple or a complex doll pattern, the key to success is choosing a design that matches your experience level and your goals for the project. Making your own dolls is a great way to express your creative style and produce wonderful gifts for children.